would you expect any less of me? really? chumby – a review… finally! Originally published at [ every moment ]. You can comment here or there. first off, let me explain a little bit about the concept of the chumby. 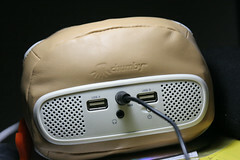 the official chumby website explains it as “your personal internet player. there’s always something good on.” but i didn’t really understand what that meant at first either. basically it looks like an oversized hackie sack, with wi-fi, speakers, usb ports, a touch screen and a motion sensor built in. you plug it in, activate it, and let it run flash-based widgets. it’s all set up to be open-source in software and hardware… so all in all, you can basically make it into what you want it to be. 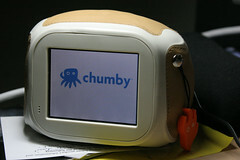 so.. what are my thoughts about my chumby? was it a good use of $175 off my paycheck? i believe so. i really enjoy the idea of this. i’ve found some really great widgets, heck i even really like it as an alarm clock to wake me up in the morning. (and actually, i’ve spent more on an alarm clock before, with less features… so for me $175 was a very reasonable price for this technology) i also like being a part of the “early adapters” group, when i can afford it. but some things i noticed so far that need improvement. 1) if you have a lot of songs on your ipod (which i do) it will ‘hang’ on that because the music player is too heavy for the little processor of the chumby. this fault has been noted on the message boards, and i’m sure they are working on a “lighter” music player to address this.. so i’m not worried. 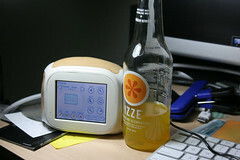 2) also sometimes the chumby freezes up on a processor intensive widget. which is fine, since the thing isn’t meant to be a “processing powerhouse” by any means… but that does point out the limits of the widgets that you can use for the chumby. 3) if you are in a wireless network that requires that you log in via a browser (not one that has a password to join the network, but one that you physically have to open up a browser and log in) you’ll run into problems joining that to the network. because there is no real “browser”, it doesn’t allow you to log into a website. you can easily set it up on most wireless networks though, and then, even when there is a password on the network, you can have it remember your network profiles and log in automatically. ps. if you want me to send you a card (i’ll be sending them mid january, for various reasons) go over here and send me your snail mail address. pps. if you remember last year i sent out a “mix cd of the year”… i will be doing that again this year. as an added bonus i’ll be sending them along with these cards. so if you want a cd, go over here and send me your snail mail address. heh. no i’m not going into rehab. i’m referring to the song “rehab” by amy winehouse. i love the song… and i love amy winehouse’s music. but it seems to have been my theme today. it was the last song i heard on my car radio before i got to work… and the first song i hear as i turn on my car to leave work. funny eh? sorry i haven’t been posting much.. i’ve just been so overwhelmed with stuff… it’s not a bad thing.. it’s just that i need to focus more of my energy on the “stuff” i have to do. it will slow down soon enough. but for now… entertain yourself by visiting nikkiana’s new message boards: the chatty cafe. that’s all for now. happy wednesday. new bag and a broken phone. first i’ll start out with the broken phone. it’s not really *completely* broken.. only broken to the point of being annoying. the little plug on the bottom of my phone, where i plug it in to charge it… is… well.. picky. i have to position the cord a certain way (usually it takes a good couple minutes to play around with it to make the connectors… well.. connect…. so that it will charge) and then TAPE the cord that way. annoying? yes. but today i got to work and i had a package at my desk! i wasn’t expecting this package so early, so it was a nice surprise. but i ordered a new messenger bag/laptop case. why did i order a new bag you ask? well let me show you…. now hopefully this bag will last longer than my old one.. since i got that old bag around a year ago. this new bag was a little more expensive… but it has a lifetime warranty, so that might help things. so now i don’t have to wear headphones while i listen to my ipod at work. and when i was wearing my headphones i couldn’t hear my phone.. or would be surprised by co-workers who came to tell me something/ask a question… so i would have to listen to only one headphone.. and it was a little uncomfortable to do that. and i found these little speakers at overstock.com for pretty cheap. and they go nice and quiet.. so it’s perfect for my little desk area! i’m happy. i’m content. if i were a cat.. i’d purr. but that’s beside the point. today was a nice day weather wise.. and pretty full, event wise. first off… last night some friends and i went out to mona’s… and while the ‘plan’ was to not stay too late.. since i had to take michele to the airport at 4:20am… and we did lose an hour due to saving daylight time so that was fun to get up an hour and a half after lying down. but anyways.. i realize that 4:30am is when all the people who can’t drive must “practice”…. on the freeway.. going 80 miles an hour. then after talking all nerdy… i suddenly lost steam… and had to take a nap. it’s funny.. i haven’t taken naps in a while.. now it seems as if they are a necessary part of my day. i actually was going to try to make it to a benefit/coffee house concert tonight.. but i ended up crashing for a killer nap on my couch and not waking up in time. but i did get up and go grocery shopping. but i was still in one of those groggy “i still haven’t woken up” states… so i’m sure i was pretty funny looking wandering through pick ‘n save. so can you tell how excited i am about the drum set? i basically now will have a professional level drum setup… which is a gianormous step from the entry-level setup i had before. now i’m more excited to play and practice. alright. i’m gonna go to bed.. even though i just woke up like.. two hours ago. my arms hurt from kickboxing… washing my hair will be difficult in the morning. come on… feel the noise…. and there’s a funny story about this new toy. at around noon-thirty, i decided it would be a good time to start my day… showered… and headed out to best buy around 2ish to take a look at some dvd/home theater systems.. since mine has been on it’s way out for the past couple years… and lately has gotten exponentially more annoying with all it’s “problems.” i ended up buying an open box version of the above model. i get it home… take it out of the box.. there’s no speaker cables… no antenna… and i need AAA batteries. *sigh* ok. trip to radio shack down the street. i spend a good chunk of time cutting wires, striping the ends, and taping them to the walls/floors so people don’t trip on them. plug in the system and play some stuff from my computer. it sounds pretty darn nice. YES THERE IS! actually there’s THREE disks you dumb inanimate object! it’s now around 6:38pm. best buy is open until 7pm on sundays. i work full time, and wouldn’t be able to take it back to best buy till wednesday. that’s just not going to fly with me. at this point i’m pretty much RUNNING with this 30-some-odd pound box… never mind the fact that it’s freezing rain and i’m the biggest clutz in the world.. i’m on a mission! so basically i get a brand new one of the above model… and this time i can use this coupon that i had gotten in the mail.. so i get around $35 credit back to my credit card. w00t. now i’m just sitting on my couch relaxing from setting up this surround sound system TWICE… but at least i have a working dvd player now. and that makes me happy. (and now for something completely unrelated) nikkiana posted a link to this movie on youtube.. and it’s hilarious.. go watch. that’s all. i’m gonna go use my new toy now. and i created my own quiz….